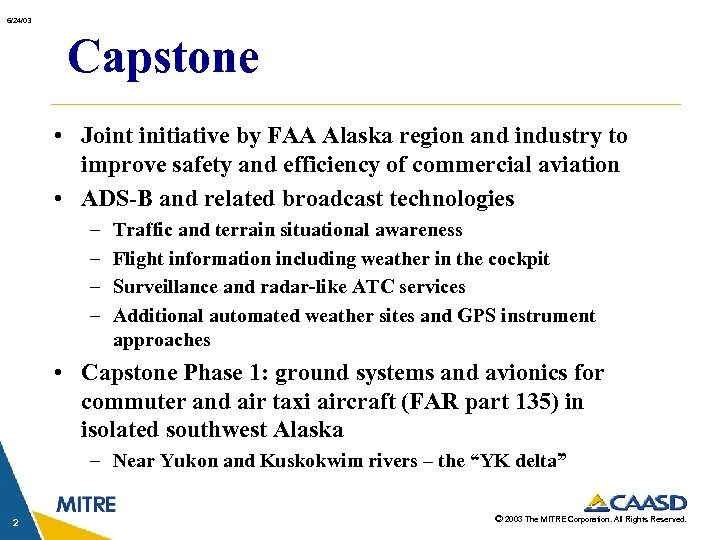 6/24/03 Capstone • Joint initiative by FAA Alaska region and industry to improve safety and efficiency of commercial aviation • ADS-B and related broadcast technologies – – Traffic and terrain situational awareness Flight information including weather in the cockpit Surveillance and radar-like ATC services Additional automated weather sites and GPS instrument approaches • Capstone Phase 1: ground systems and avionics for commuter and air taxi aircraft (FAR part 135) in isolated southwest Alaska – Near Yukon and Kuskokwim rivers – the “YK delta” 2 © 2003 The MITRE Corporation. All Rights Reserved. 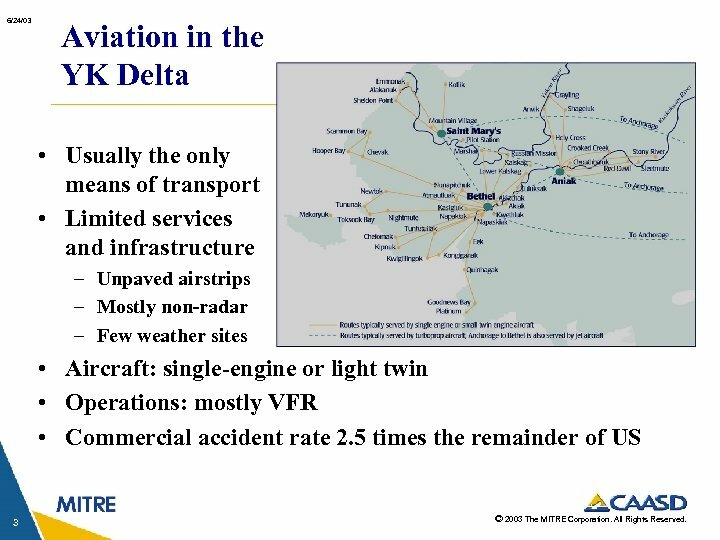 6/24/03 Aviation in the YK Delta • Usually the only means of transport • Limited services and infrastructure – Unpaved airstrips – Mostly non-radar – Few weather sites • Aircraft: single-engine or light twin • Operations: mostly VFR • Commercial accident rate 2. 5 times the remainder of US 3 © 2003 The MITRE Corporation. All Rights Reserved. 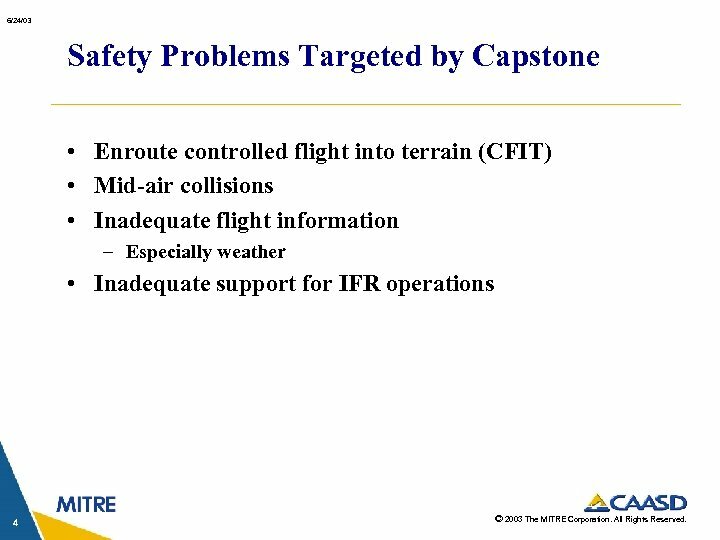 6/24/03 Safety Problems Targeted by Capstone • Enroute controlled flight into terrain (CFIT) • Mid-air collisions • Inadequate flight information – Especially weather • Inadequate support for IFR operations 4 © 2003 The MITRE Corporation. All Rights Reserved. 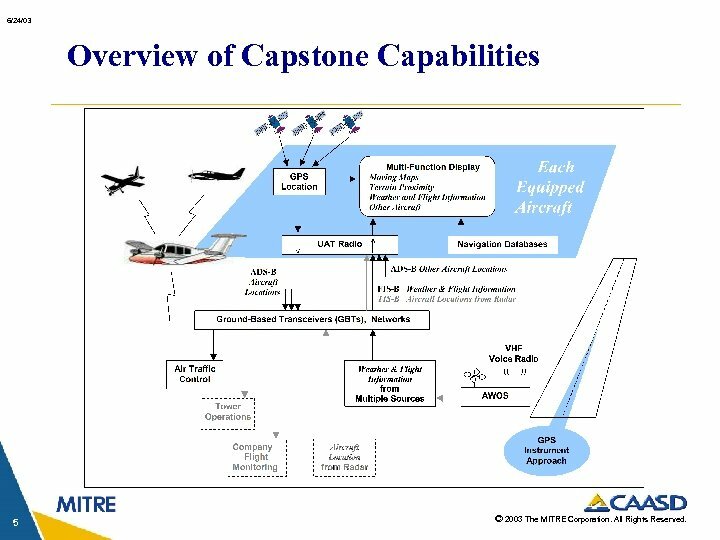 6/24/03 Overview of Capstone Capabilities 5 © 2003 The MITRE Corporation. All Rights Reserved. 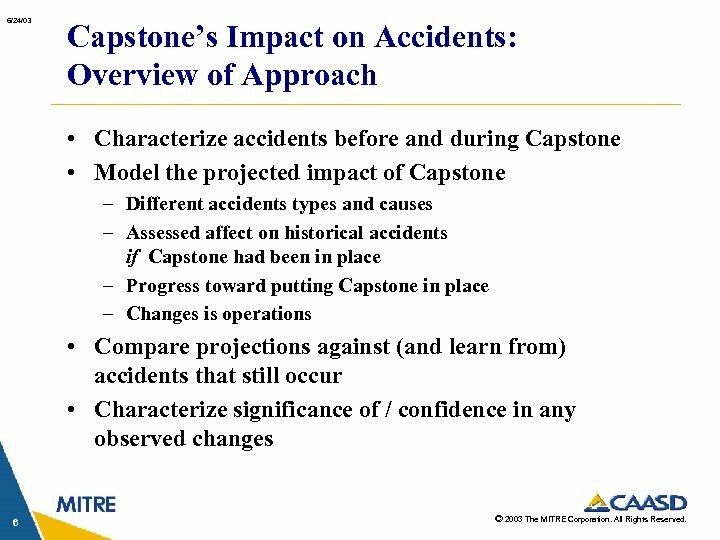 6/24/03 Capstone’s Impact on Accidents: Overview of Approach • Characterize accidents before and during Capstone • Model the projected impact of Capstone – Different accidents types and causes – Assessed affect on historical accidents if Capstone had been in place – Progress toward putting Capstone in place – Changes is operations • Compare projections against (and learn from) accidents that still occur • Characterize significance of / confidence in any observed changes 6 © 2003 The MITRE Corporation. All Rights Reserved. 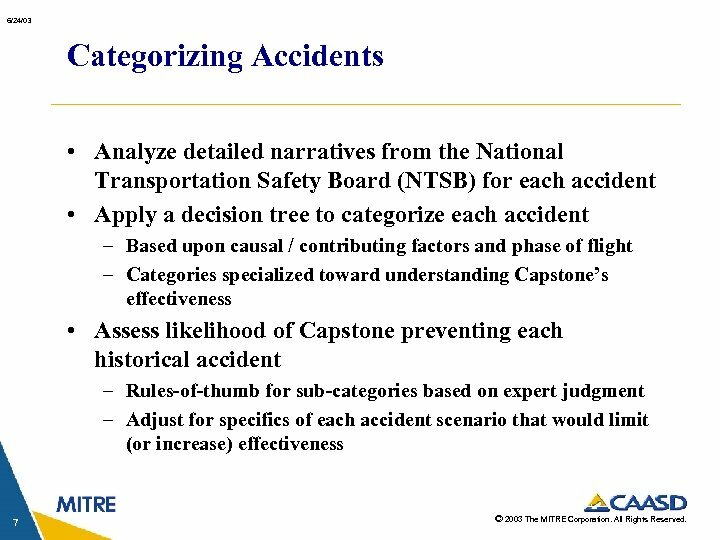 6/24/03 Categorizing Accidents • Analyze detailed narratives from the National Transportation Safety Board (NTSB) for each accident • Apply a decision tree to categorize each accident – Based upon causal / contributing factors and phase of flight – Categories specialized toward understanding Capstone’s effectiveness • Assess likelihood of Capstone preventing each historical accident – Rules-of-thumb for sub-categories based on expert judgment – Adjust for specifics of each accident scenario that would limit (or increase) effectiveness 7 © 2003 The MITRE Corporation. All Rights Reserved. 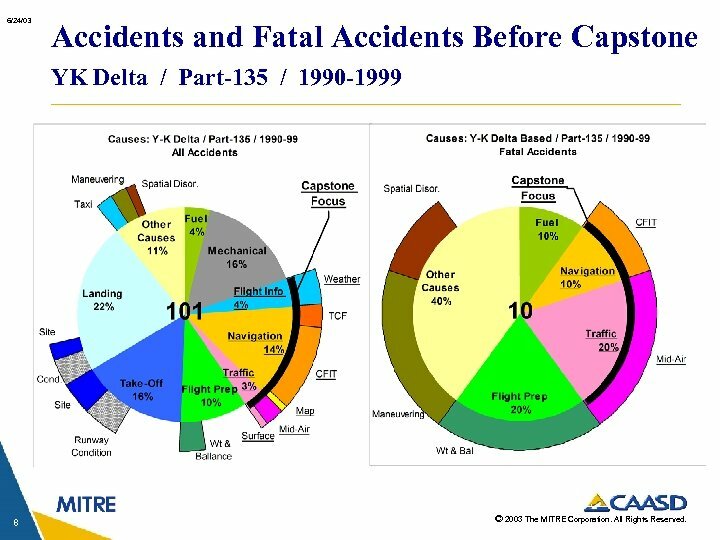 6/24/03 Accidents and Fatal Accidents Before Capstone YK Delta / Part-135 / 1990 -1999 8 © 2003 The MITRE Corporation. All Rights Reserved. 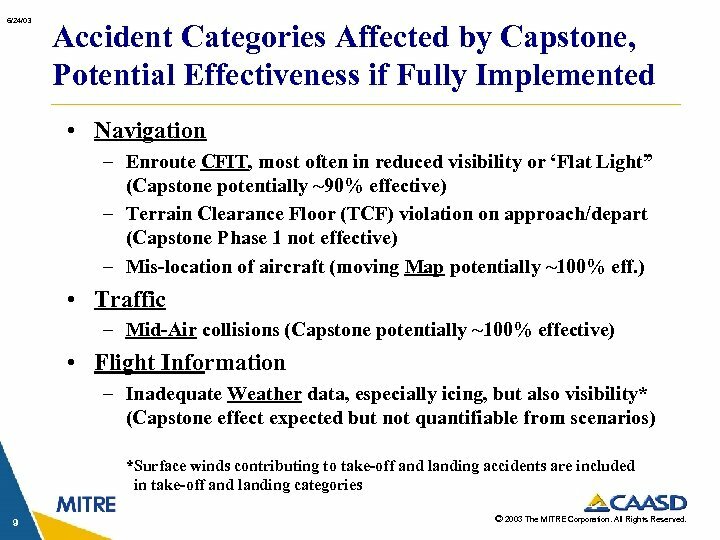 6/24/03 Accident Categories Affected by Capstone, Potential Effectiveness if Fully Implemented • Navigation – Enroute CFIT, most often in reduced visibility or ‘Flat Light” (Capstone potentially ~90% effective) – Terrain Clearance Floor (TCF) violation on approach/depart (Capstone Phase 1 not effective) – Mis-location of aircraft (moving Map potentially ~100% eff. ) 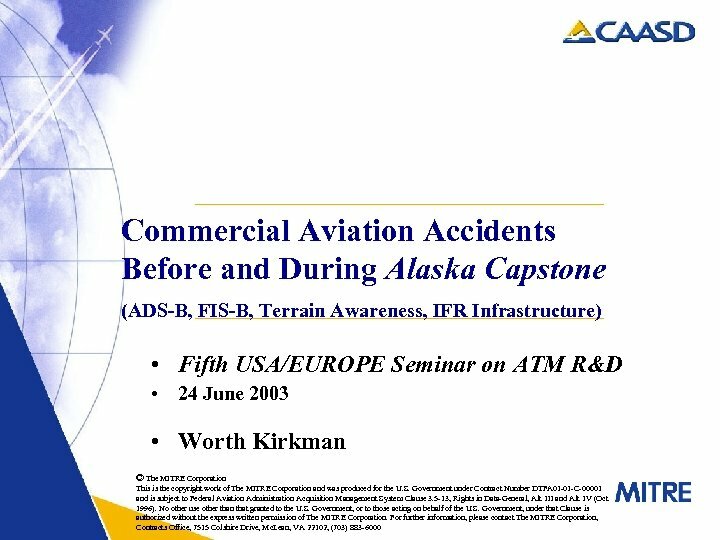 • Traffic – Mid-Air collisions (Capstone potentially ~100% effective) • Flight Information – Inadequate Weather data, especially icing, but also visibility* (Capstone effect expected but not quantifiable from scenarios) *Surface winds contributing to take-off and landing accidents are included in take-off and landing categories 9 © 2003 The MITRE Corporation. All Rights Reserved. 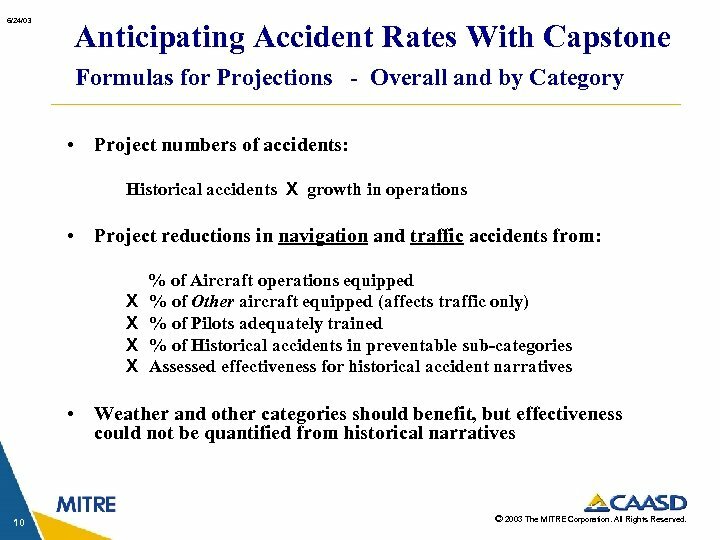 6/24/03 Anticipating Accident Rates With Capstone Formulas for Projections - Overall and by Category • Project numbers of accidents: Historical accidents X growth in operations • Project reductions in navigation and traffic accidents from: X X % of Aircraft operations equipped % of Other aircraft equipped (affects traffic only) % of Pilots adequately trained % of Historical accidents in preventable sub-categories Assessed effectiveness for historical accident narratives • Weather and other categories should benefit, but effectiveness could not be quantified from historical narratives 10 © 2003 The MITRE Corporation. All Rights Reserved. 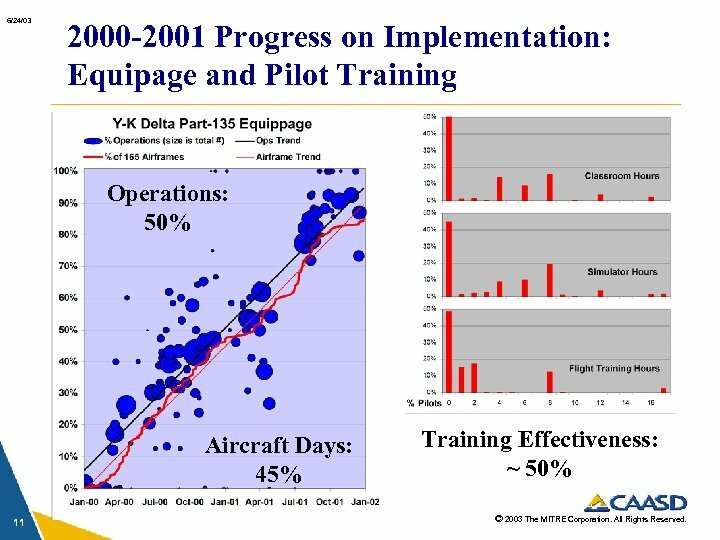 6/24/03 2000 -2001 Progress on Implementation: Equipage and Pilot Training Operations: 50% Aircraft Days: 45% 11 Training Effectiveness: ~ 50% © 2003 The MITRE Corporation. All Rights Reserved. 6/24/03 Anticipated vs. 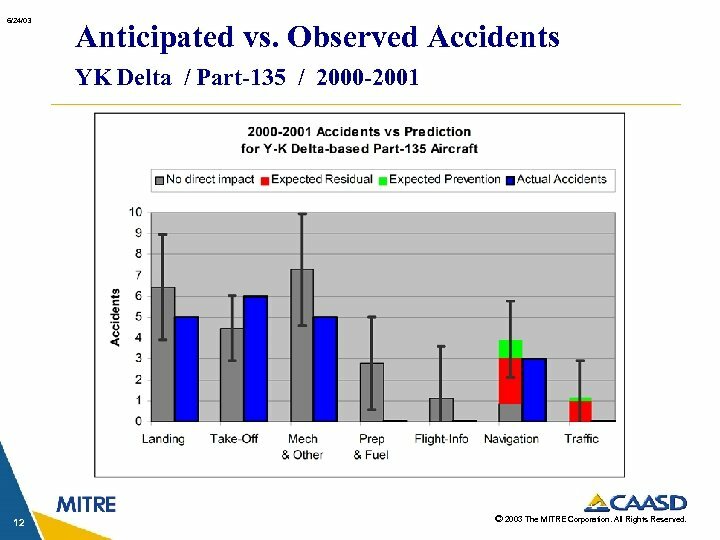 Observed Accidents YK Delta / Part-135 / 2000 -2001 12 © 2003 The MITRE Corporation. All Rights Reserved. 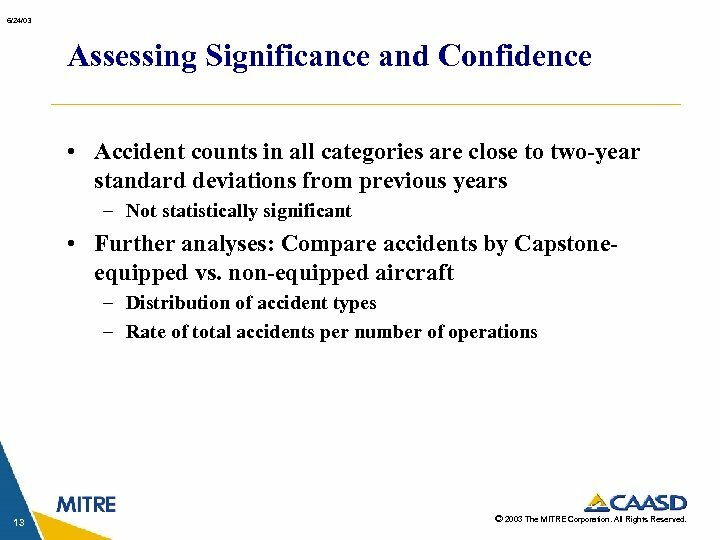 6/24/03 Assessing Significance and Confidence • Accident counts in all categories are close to two-year standard deviations from previous years – Not statistically significant • Further analyses: Compare accidents by Capstoneequipped vs. non-equipped aircraft – Distribution of accident types – Rate of total accidents per number of operations 13 © 2003 The MITRE Corporation. All Rights Reserved. 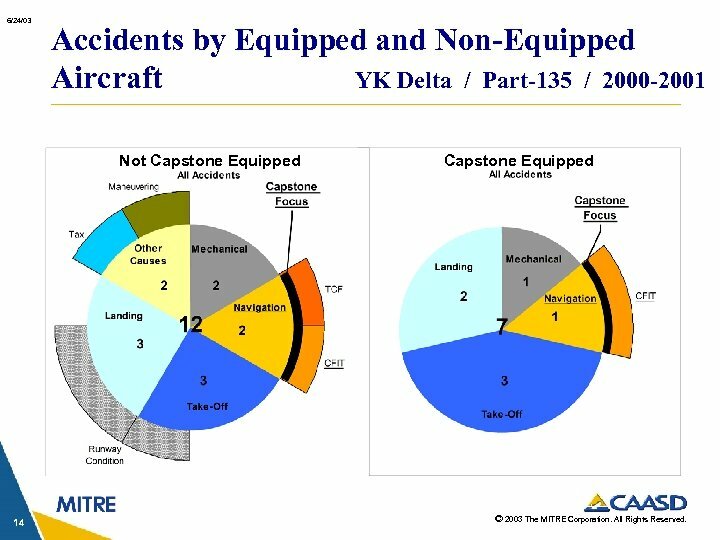 6/24/03 Accidents by Equipped and Non-Equipped Aircraft YK Delta / Part-135 / 2000 -2001 Not Capstone Equipped 14 Capstone Equipped © 2003 The MITRE Corporation. All Rights Reserved. 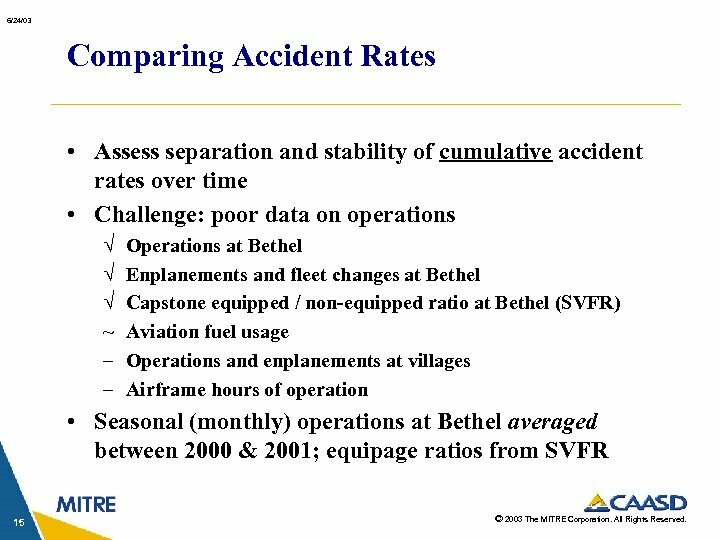 6/24/03 Comparing Accident Rates • Assess separation and stability of cumulative accident rates over time • Challenge: poor data on operations Ö Ö Ö ~ – – Operations at Bethel Enplanements and fleet changes at Bethel Capstone equipped / non-equipped ratio at Bethel (SVFR) Aviation fuel usage Operations and enplanements at villages Airframe hours of operation • Seasonal (monthly) operations at Bethel averaged between 2000 & 2001; equipage ratios from SVFR 15 © 2003 The MITRE Corporation. All Rights Reserved. 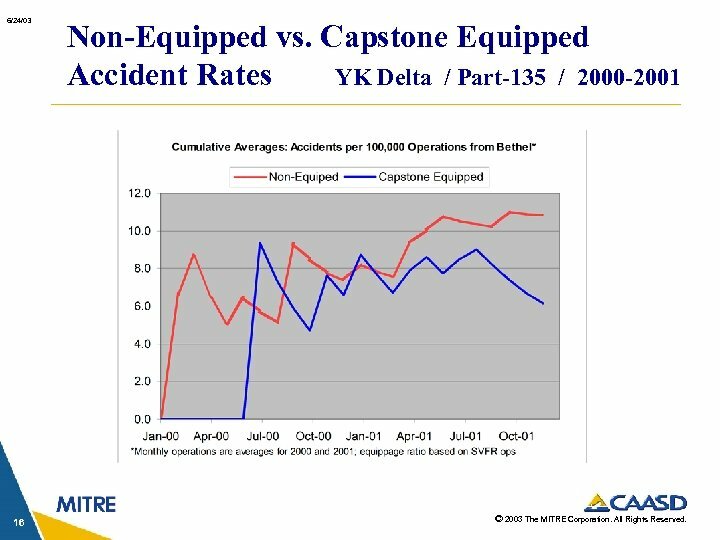 6/24/03 16 Non-Equipped vs. Capstone Equipped Accident Rates YK Delta / Part-135 / 2000 -2001 © 2003 The MITRE Corporation. All Rights Reserved. 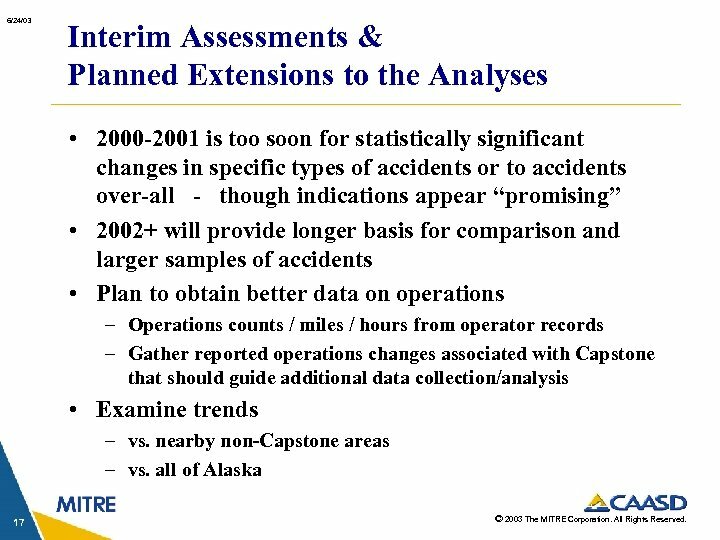 6/24/03 Interim Assessments & Planned Extensions to the Analyses • 2000 -2001 is too soon for statistically significant changes in specific types of accidents or to accidents over-all - though indications appear “promising” • 2002+ will provide longer basis for comparison and larger samples of accidents • Plan to obtain better data on operations – Operations counts / miles / hours from operator records – Gather reported operations changes associated with Capstone that should guide additional data collection/analysis • Examine trends – vs. nearby non-Capstone areas – vs. all of Alaska 17 © 2003 The MITRE Corporation. All Rights Reserved. 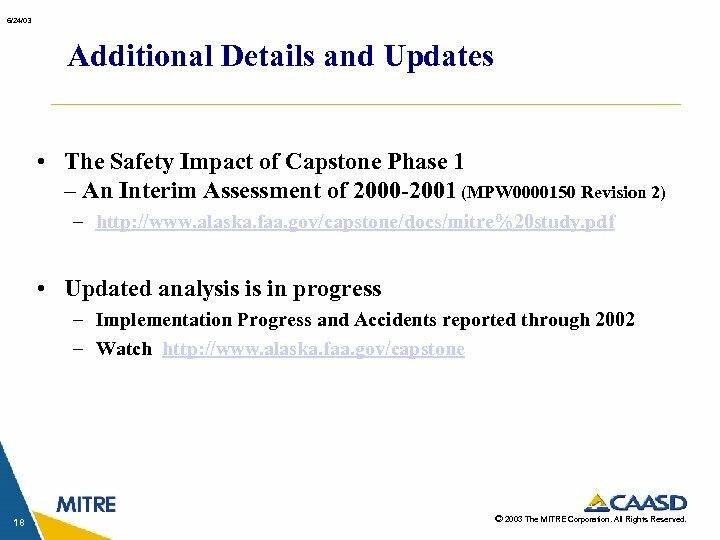 6/24/03 Additional Details and Updates • The Safety Impact of Capstone Phase 1 – An Interim Assessment of 2000 -2001 (MPW 0000150 Revision 2) – http: //www. alaska. faa. gov/capstone/docs/mitre%20 study. pdf • Updated analysis is in progress – Implementation Progress and Accidents reported through 2002 – Watch http: //www. alaska. faa. gov/capstone 18 © 2003 The MITRE Corporation. All Rights Reserved.